Sterling Children's Books, 9781454920670, 208pp. Zach really wants to meet Abhi, the new girl at school. But things get off to a rough start when he accidentally knocks her to the ground during a game of dodgeball. And whenever he tries to make amends, she just ignores him. Nothing works--not his friends' advice or his "lucky" cologne. In fact, he just seems more and more cursed Then, at the Fall Fiesta-val, Zack finally learns the real reason behind Abhi's cold shoulder . . . but not before total chaos erupts. With a runaway train, exploding confetti-filled eggs, and Abhi's terrifying older brother, will Zack ever get a chance to talk to his crush? In the end, Zack learns what it means to believe, to listen, and to be a good friend. This dynamite sequel captures the middle-school experience--and will keep readers laughing from beginning to end. Jeff Anderson is the author of Zack Delacruz: Me and My Big Mouth, Mechanically Inclined, Everyday Editing, 10 Things Every Writer Needs to Know, and Revision Decisions (all Stenhouse). 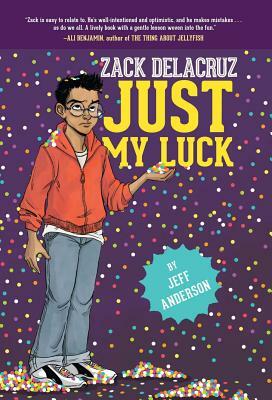 Zack Delacruz 2 is the wacky sequel to his debut middle-grade novel. Jeff grew up in Austin, Texas, and learned to love writing by journaling and crafting stories to entertain his friends over the phone. A former elementary and middle school teacher, Jeff travels to schools across the country working with teachers and students to discover joy and power in the writing process. Jeff lives with his partner, Terry, and their dogs, Carl and Paisley. Find out more about Jeff at writeguy.net or follow him on Twitter @writeguyjeff. Jeff lives in San Antonio, TX. Andrea Miller is an illustrator, a children's book designer at Sterling Publishing, and a graduate of The University of the Arts in Philadelphia. She lives with her wife, her six bookshelves, and a box of ink and brushes. The illustrator of Zack Delacruz: Me and My Big Mouth, you can find her work online at andreacmiller.com. Andrea lives in Brooklyn, NY.